Strictly to fulfill the duties of fashionable life in London during the season is more of a toil than a pleasure. There is so much it is imperative to do, there are so many places to attend that a votary has literally not a moment’s real leisure. 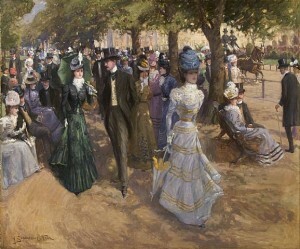 There is the ride or drive in the Park, which gives place on Sundays to the Church Parade after morning service; there are picture-galleries to visit; interviews with dressmakers, tailors, etc, to be undergone; shopping to be effected; calls to make, callers to receive; Lord’s, Hurlingham, Ranelagh, to attend; the Meet of the Coaching Club or the Four-in-Hand to be present at, when something like twenty or thirty magnificent “turn-outs” start from the Horse Guards’ Parade or the Magazine in Hyde Park amidst a large crowd of admiring spectators who line the Ring Drive. 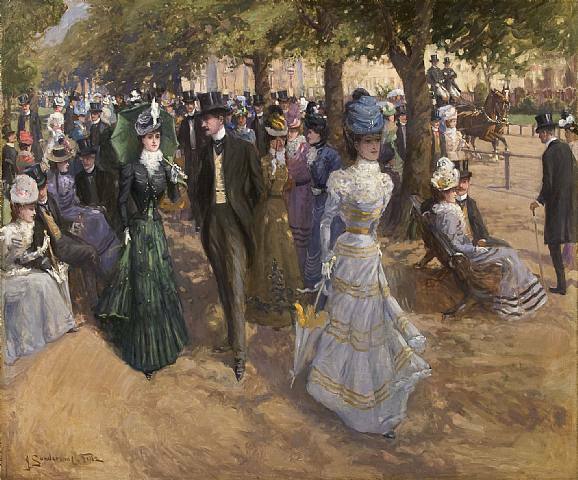 There are innumerable luncheons, dinner-parties, at-homes, receptions, concerts, recitals, theatres, operas, etc, etc, etc, to absorb much time and attention, besides the grander functions of Drawing-Rooms, State Balls and Concerts, Royal Garden-parties, etc. This is only the so-called pleasurable side of fashionable life. There is another, and that is the philanthropic – the necessity in these days of attending all kinds of societies for charitable objects (fancy bazaars, etc), in itself enough occupation for most people. Let the following extracts from the Diary of a Society Leader speak for themselves as to the very arduous duties involved in the much-envied position. It is called “A Day in my Life,” and appeared a few years ago in Cassell’s Magazine. 10.30. Ride in the Row. 11-30, Interview housekeeper, also make arrangements about leaving town for the “end of the week,” and entertaining a small party at Z__ Park. Change dress, and give maid instructions for the day. 12.30. Walk to Busvine’s to order a cooler coat for riding. See Mason about new evening frock, and choose new hat at Esme’s – a good deal to do in one hour. 1.30. Reach home to find more notes to read while bearers wait for replies, and some one waiting to ask me if I will allow my portrait to appear in journal with photograph of Y__ House and Z__ Park. Change dress again before friends drop in to luncheon. 3-30. Drive to East-end to open a bazaar. 4-30. Have made a speech and spent more money than I meant to do. So few buyers, and people wretchedly poor. 5-30. Went to Lady E. L.’s garden-party. Leave cards after last night’s parties and inquiries for Lady M__ and Miss B__ (who have both been unwell) on my way home. 6.30. Find two telegrams to answer and three people waiting to see me. Will I support Irish Emigrants’ Charitable Institution by a present or subscription? Will I be a patroness of Signor H.’s concert? And have I time to discuss the arrangements for next week’s theatricals in aid of St. Ursula’s Hospital? 7.30. Dress for dinner and remind myself where I am going while I dress. Impossible to answer all my letters. 8.30 to 10.30. Entertain a party of fourteen at dinner. 11-30. Concert at F__ House, very select; but wretched singing and worse music. Wish now I had gone to Mr. A__’s, where all the “stars” were to be, regardless of expense. 1.30. Mrs. C. S__’s cotillon. 2.30. The Duchess of A.’s ball. 3.30. Bed at last, and thankful for even five hours’ rest. I love these accounts of a busy socialite’s day! I’ve found a couple documenting Georgiana’s. They just scream: It’s so demanding being me! It’s a hard job but someone has to do it!